Shrove Tuesday falls on March 8 this year, but in Italy the sweets and pastries that one traditionally eats during Carnevale have been on offer in bakeries all over Rome for some weeks now, the pavements are already sprinkled with confetti, whilst on Sunday afternoons small children decked out in fancy dress costumes can be seen out and about in town. Mardi Gras, Fat Tuesday or Pancake Day...Carnevale (or Carnival) has many names and is celebrated all over the world, but this vintage French postcard from the 1920s reminded instantly of the Italian celebration. 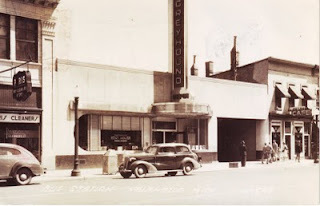 Published by prolific Paris printers Lèo of Pradot, this is yet another striking example of the hand-tinted real photograph vintage postcards that were so popular at the time – this one must surely win the prize for most garish colours, however! There's no colour enhancement with this scan – those pinks really are that bright on the original card! 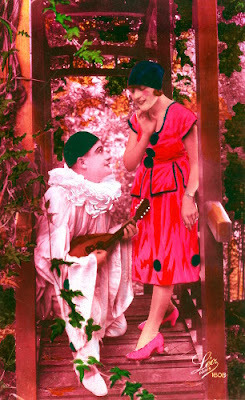 This uncirculated postcard features the lovestruck Pierrot, a famous stock character from Italian pantomime, wearing his classic loose white gowns, frilly collar and black skullcap, wooing a 1920s version of Columbine, who in the traditional pantomimes or Commedia dell'Arte plays breaks his heart when she leaves him for another very famous character - Harlequin. In the late 17th-century an Italian troupe of players performing in Paris called the Comédie-Italienne made these Italian masked plays popular in France, so it seems particularly appropriate that this should be a Parisian postcard. Whilst doing a little research for this post I was reminded of a favourite song from 1980 that illustrates the enduring popularity of the Pierrot motif – David Bowie appeared as the character in the video for Ashes to Ashes, although his Pierrot sports the conical dunce's cap. Watch that blast from the past below or click here to watch it on YouTube! Check out the Vintage Postcard Store for more Pierrot postcards.